Turbo lag rears its head on occasion in the A5 convertible, which is strange given how little there is in other Audis we've tested with the same engine. Throw in a case of relaxed accelerator response, and the drivetrain doesn't react immediately to your right foot, particularly in the passing lane. Shortly thereafter, there's ample power as the turbo kicks in, but the A5 has neither the quick-revving immediacy of a BMW 328i nor the all-out push of an Infiniti G37. The Lexus IS 250C is pokier still, but the A5 is rarely exhilarating. Audi's six-speed automatic is a mediocre dance partner. It upshifts early and often, keeping the engine from hitting its stride at higher revs unless you push the car hard. At least it kicks down quickly enough on the highway — though the issues above still hamstring passing power more than the automatic can salvage it. 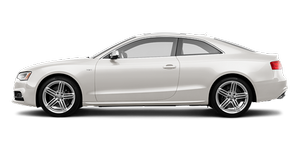 Our test car had Audi's optional Audi Drive Select, which varies drivetrain, suspension and steering response to Comfort, Auto and Dynamic modes. The performance-oriented Dynamic mode cuts a bit of the accelerator lag, though not enough to solve its problems. It doesn't seem to issue any new marching orders for the automatic, either. Should you tire of the shifting patterns, a manual-shift mode allows you to take over. Four-wheel-disc antilock brakes are standard. Some may find the pedal a bit touchy at first, but its overall response is strong. With some practice, it's easy to fine-tune your deceleration.